Disney magic. It’s a term that looks great on the brochures, and in the commercials, but have you ever witnessed it? What does that even mean, Disney magic? Is it the term that Disney execs use to magically make your money disappear from your bank account? Yes, a little bit. Is it the term that is used when designers and “Imagineers” don’t want to tell you how they do something? Yes, it’s that too. But Disney magic, true Disney magic, comes from somewhere else. It comes from experiences that we have in the park, and it comes from the overall feeling that we get from being in the park. 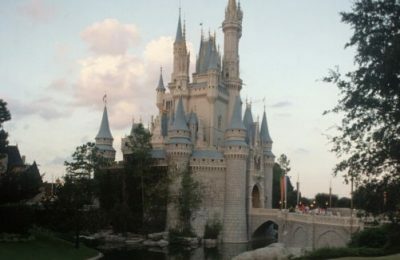 True Disney magic is hard to come by, simply because it’s not very magical shelling out $100 dollars for a ticket, and waiting in four hour lines to see a princess. However, it does exist, I found it! I witnessed it first hand! Like most things magical, it begins through the eyes of a child…and a mouse. Meet Bee. He is 2 years old, tall for his age and very aware of the world around him. He’s my nephew, and like a lot of parents these days, his mom works long hours to make end meet. He spends a lot of time with us, and being that we love theme parks (and the fact that he’s two) has grown fond of all things Disney. He absolutely loves Mickey, Buzz, Woody and Frozen. Why all this personal information? Because it’s very important to know that he is attached to mommy whenever she is around, and it’s also important to know that because he hasn’t been to very many theme parks, he doesn’t know what to expect. We managed to get tickets for ourselves to the first Mickey’s Very Merry Christmas Party of 2014, and decided “Hey, Bee is 2 and he’s free, let’s take him!”. Bee, like many young boys, has an affinity for trains. He goes absolutely nuts for them. I showed him video of the monorail (which he calls the train in the sky), and he positively lit up. This had to be something his mom experienced as well. 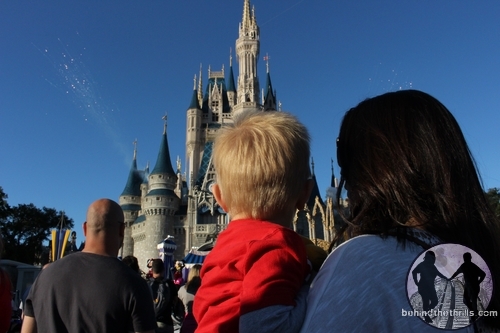 Many people will tell you about the dangers of taking a toddler to Disney. They won’t remember the trip, they will be cranky, they can’t go on most of the rides. All of that is true. But what they don’t tell you is that as a toddler, they are seeing something completely for the first time. Sure, you can wait until they are 4 or 5, but by that time they already have seen something of Walt Disney World on television, and they know what it is. They know where they are going and know a bit of what to expect. When they’re two, however, they have no clue. Everything is new. He knew Mickey Mouse, and he knew that Mickey Mouse has a castle…he sees it on the Disney movies and yells “Mickey’s Castle”. He didn’t know that it was a real place. 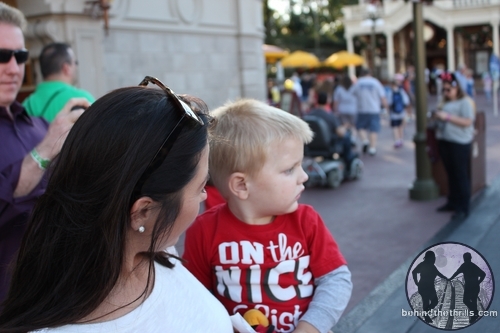 So, as we enter Magic Kingdom, he begins to take in the sights and colors of everything. He then takes a peek at that huge castle in the background, down Main Street. The picture above is that very moment. He didn’t know what to think…he sat there and stared. A huge smile came over his face. At two, that’s what everything is, a series of small reactions, at least it was for him. It was amazing seeing him come into this magical world and experiencing everything for the first time. 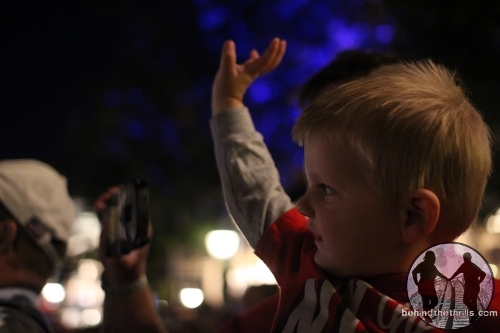 So what can you do at Disney with a Two year old? Surprisingly, just about everything. The shows are the main point, however, because they didn’t require him to be locked into anything or be in the dark in an enclosed place. The shows were about the best thing. From seeing Mickey for the first time in person, to going absolutely nuts when Woody came rolling by in the Mickey’s Once Upon a Christmas Parade. He could wave, cheer, clap and sing all from a safe distance. What about the rides? Since we were trying to take things pretty slow, and enjoy the rest of the Christmas event, we went light on the rides at first, picking what we thought would fit him best. We didn’t try anything that was too fast, or in a car that would lock him down. Kids absolutely hate to be locked into something. The best first ride? The monorail…that train in the sky. It gave him the freedom to stand up while riding, take a few steps and star out windows. The People Mover, or Tomorrowland Transit Authority was also a huge success. Being able to sit comfortably without any restraint is a big thing with a little guy who is always on the go. The only problem, as expected was the parts near or in Space Mountain. That was a little scary, and even gave way to some quiet tears. The only thing we could do is reassure and cheer as we came out. Dumbo was also a pretty good success, although there were tears at first. That whole being buckled down thing is a little scary, but once it was in the air, it was awesome. Small World is a natural, with all the kids and music. We tried Little Mermaid, but it was a little on the scary side, simply because of the dark portions. The songs and fish made it better, but the general consensus was that anything similar would not be good. That meant that no Haunted Mansion or Pirates this time around. Of course we rushed to grab him, not wanting to skip everyone in line. Jack, however, made the situation a little better by simply kneeling down and opening his arms. What was it about this weird looking creature that Bee found so appealing? We don’t know, but that was the only character hug he gave throughout the night. Characters are kind of a hit and miss thing. Kids see them, and yes they look cuddly…but they MOVE. That’s got to be terrifying for someone that small. Still, it’s all about your interaction with them and the characters. Like everything, we let Bee go at his own pace. If he didn’t want to be near a character, we didn’t push it. That was the best way to it, let him discover things on his own, because that’s what being a kid is all about. To see that discovery from my point of view is simply amazing. My own kids are teenagers now, and for the most part the discovery and wonder are gone. They know how things work, they know where things are hidden and they know where that Disney magic comes from. And there’s the key. 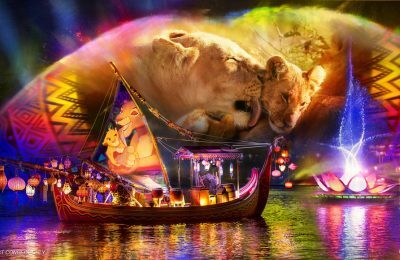 The Disney magic comes from that innocence of not knowing, and not wanting to seeking it out. It’s there, and as a kid Bee simply sees it. He doesn’t know that it’s a person in the suit, or even someone behind the curtain. He knows that it’s real, and that’s all that matters. He accepts that a mouse can talk, and that mermaids sing and are real. It’s the wonder of discovering it all for the first time that makes it so magical. And that’s the best kind of magic in the world. 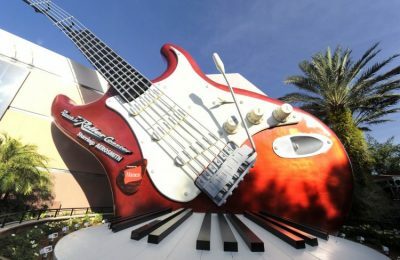 Stay tuned for even more Disney magic, and be sure to get social with us on Facebook, and follow along with us on Twitter @BehindThrills for the latest updates! 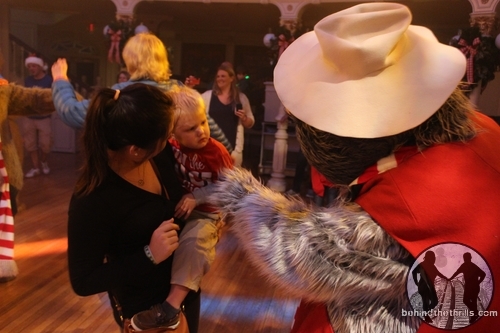 Previous PostSandy Claws comes to Magic Kingdom as Jack Skellington debuts at Mickey's Very Merry Christmas Party Next PostThrill Weekly Polls-Vote for the Attraction for 2014!